Summers are getting wetter, soils are less acidic and plant species richness is increasing, according to long-term environmental studies. While UK air temperatures have risen significantly since the onset of industrialisation (in line with the expected consequences of global warming), air temperatures at ECN sites showed little net change over the specific 1993-2012 period studied. Nevertheless nearly all of the twelve ECN sites experienced marked increases in the amount of summer rainfall, while the frequency and intensity of rainfall also increased. The effect of large recent reductions in acidic emissions from power stations and heavy industry can be seen in substantial reductions in the atmospheric deposition of sulphur and acidity to all ECN sites. This in turn has stimulated a gradual but widespread reduction in the acidity of non-agricultural soils. Conversely, atmospheric concentrations of ammonia produced primarily from agricultural sources and which can have an undesirable fertilising effect on sensitive plant species, showed relatively little change across the network over the monitoring period. Taking measurements at an ECN terrestrial monitoring site. Surprisingly, the number of plant species occurring within a given area (plant species richness) increased across a range of different habitats. These changes were most clearly linked to reductions in soil acidity, although species with a preference for wetter soils increased in some drier lowland locations, while reductions in the use of fertilisers were also likely to have contributed to the overall pattern in more agricultural situations. This Special Issue marks the first twenty years of monitoring at terrestrial ECN sites where measurements of weather, air quality, soil and water chemistry and a range of plants and animals are made in close proximity using standard monitoring methods by a consortium of the UK’s environmental research institutes and agencies. Compiled by guest editors Andrew Sier and Don Monteith of the Centre for Ecology & Hydrology, the collection of papers illustrates the diverse ways in which ECN’s long-term environmental monitoring and associated research helps to identify and quantify the causes and consequences of environmental change across a broad range of UK habitats. In addition to detailing changes in weather, air pollution and plant communities at the sites, studies also include investigations into responses of plant, butterfly, moth and ground (carabid) beetle communities to changes in the environment driven by changing weather patterns (eg. summer temperatures and drought events) and local management. Other papers focus on the causes and implications of changes in soil and water chemistry, with a particular emphasis on increases in Dissolved Organic Matter in streams and rivers that is presenting a major problem for the water industry who need to remove it prior to the disinfection process. Data from a freshwater ECN site, Lough Neagh, is used to determine the ecological impact of nutrient pollution on the lake and the likely consequences of future management coupled with expected changes in climate. Finally, findings from all terrestrial monitoring sites are used to test recently developed tools designed to quantify the changing balance of a wide range of “ecosystem services” perceived to be supplied by the natural environment. The findings are published in Sier, A and Monteith, D (editors). 2016. Assessing ecosystem resilience through Long Term Ecosystem Research: observations from the first twenty years of the UK Environmental Change Network. Ecological Indicators 68, 1-156. The Environmental Change Network is coordinated by NERC's Centre for Ecology & Hydrology. ECN monitoring and research is funded by the Agri-Food and Biosciences Institute, the Biotechnology & Biological Sciences Research Council, Natural Resources Wales, the Defence Science and Technology Laboratory, the Department for Environment Food and Rural Affairs, Environment Agency, the Forestry Commission, Natural England, the Natural Environment Research Council, the Northern Ireland Environment Agency, the Scottish Environment Protection Agency, Scottish Natural Heritage, the Scottish Government and the Welsh Government. 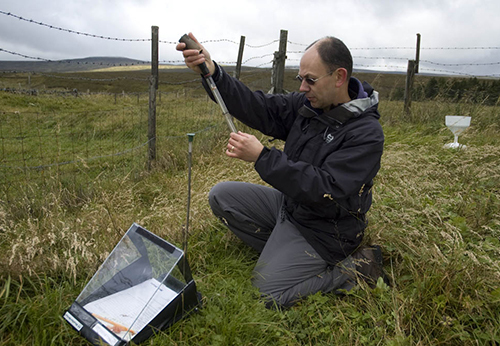 Essential scientific support is provided by NERC Centre for Ecology & Hydrology, ADAS, Forest Research, Marine Scotland: Science, Rothamsted Research, The James Hutton Institute and members of the UK Upland Waters Monitoring Network. Other organisations funding research highlighted in the special issue are: the Department of Agriculture and Rural Development (NI), the European Union, the British Trust for Ornithology, the Heather Trust and the University of Reading.